When you buy the motorcycle of your dreams, whether it’s a high performance superbike, statement Harley or a lovingly restored Triumph, you’ll naturally want to protect your investment. Of course, not all of us have the luxury of a garage or a dry spot where we can store our bikes throughout the year. But don’t let the threat of rust, dirt, crime and careless drivers keep you awake at night. Instead, as the days start to draw in and the mercury drops, think carefully about your storage options and put the essential preparatory work in place. Leaving your bike out in the elements under a simple cover will not provide the protection that your pride and joy deserves, so ideally it should be kept inside. Some motorbike dealers offer a storage option, so it might be worth a quick enquiry. If you decide to store the bike yourself, choose a location away from a window. The UK might not be famed for its sunny winters, but any ultraviolet light that does shine through can fade paint and plastic parts. If proximity to a window is unavoidable, make sure that it’s covered with a non-transparent sheet. Acids are produced in the oil when the bike is in use, and this can cause damage to the inner metal surfaces. For this reason, it’s always a good idea to freshen up the oil before a spell of prolonged inactivity. 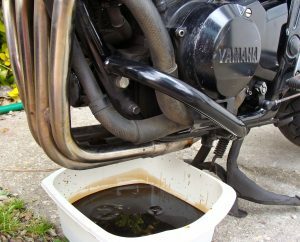 Add fresh motorcycle oil – preferably a winter grade (5w30) – and dispose of the old oil responsibly. Fill up the tank before you lay your bike to rest. Be careful not to overfill the tank as the fuel will need room to expand. Then, add a stabiliser to prevent moisture accumulation. This will keep the fuel from going stale. 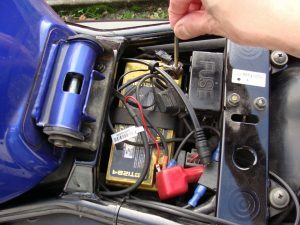 The battery must be disconnected and removed before the bike goes into storage. In cold weather the battery can freeze, causing it to crack and leak an acidic solution over your bike. Once the battery is removed, clean the terminals with a wire brush and lube them with dielectric grease. The battery should be kept in a clean, dry place and charged in a well ventilated area. It might seem daft to polish a bike destined for storage, but the wax will actually act as an effective barrier against rust and moisture. You should also give metal surfaces like the frame or engine a light spray of WD-40 to keep them shiny and corrosion free. This should include the mufflers and exhaust, which can quickly rust when not in use. Once they’re dry, cover each muffler with a plastic bag to keep any moisture out. Inflate both tyres to the maximum recommended pressure. 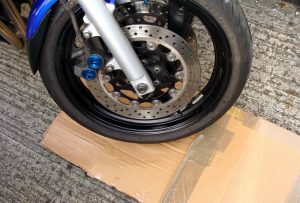 If the bike is stood on a concrete or metal floor, place some cardboard underneath the tyres to prevent the rubber from freezing. Once you’re done, it’s time to put a cover over the bike and say goodbye for the winter months. Investing in a decent cover is well worth the additional expense, as coverings like tarps and old sheets can actually do more harm than good! Nathan writes on behalf of Easystore Self Storage, a storage provider with facilities in Cardiff and Bridgend, South Wales, where people can store domestic and commercial goods as well as vehicles – including motorcycles.